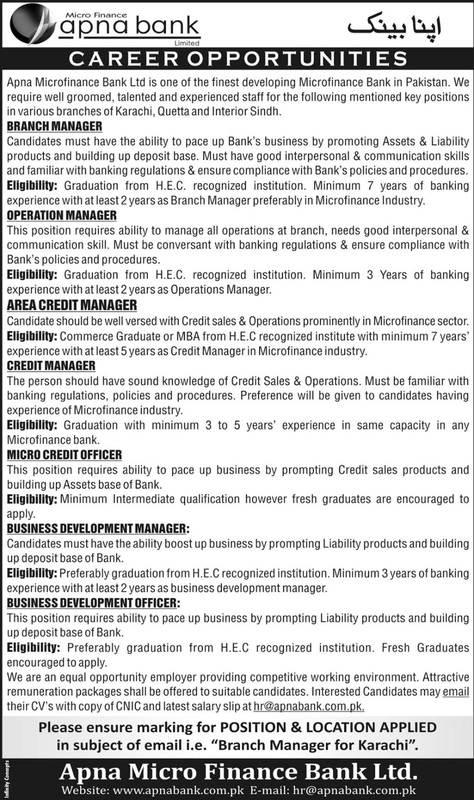 Apna Microfinance Bank Limited Balochistan-Sindh. Apna Microfinance Bank Ltd is one of the finest developing Microfinance Bank in Pakistan. We require well groomed, talented and experienced staff for the following mentioned key positions in various branches of Karachi, Quetta and Interior Sindh. Candidates must have the ability to pace up Bank's business by promoting Assets & Liability products and building up deposit base. Must have good interpersonal & communication skills and familiar with banking regulations & ensure compliance with Bank's policies and procedures. Eligibility: Graduation from H.E.C. recognized institution. Minimum 7 years of banking experience with at least 2 years as Branch Manager preferably in Microfinance Industry. This position requires the ability to manage all operations of the branch, needs good interpersonal & communication skill. Must be conversant with banking regulations & ensure compliance with Bank's policies and procedures. Eligibility: Graduation from H.E.C. recognized institution. Minimum 3 Years of banking experience with at least 2 years as Operations Manager. Candidate should be well versed with Credit sales & Operations prominently in the Microfinance sector. Eligibility: Commerce Graduate or MBA from H.E.0 recognized institute with minimum 7 years' experience with at least 5 years as Credit Manager in the Microfinance industry. The person should have sound knowledge of Credit Sales & Operations. Must be familiar with banking regulations, policies and procedures. Preference will be given to candidates having experience in the Microfinance industry. Eligibility: Graduation with minimum 3 to 5 years' experience in the same capacity in any Microfinance bank. This position requires the ability to pace up business by prompting Credit sales products and building up Assets base of Bank. Eligibility: Minimum Intermediate qualification however fresh graduates are encouraged to apply. Candidates must have the ability boost up business by prompting Liability products and building up a deposit base of Bank. Eligibility: Preferably graduation from H.E.0 recognized institution. Minimum 3 years of banking experience with at least 2 years as a business development manager. This position requires the ability to pace up business by prompting Liability products and building up a deposit base of Bank. Eligibility: Preferably graduation from H.E.C recognized institution. Fresh Graduates encouraged to apply. Please ensure marking for POSITION & LOCATION APPLIED in the subject of email i.e. "Branch Manager for Karachi". Apna Micro Finance Bank Ltd.